The most common food that we eat as Nigerians is Rice. If you recollect the meals you ate in the past 24 – 48 hours, there is a high chance that rice is part of it. If you attend any Nigerian “Owambe” party, the most common meals that is available is Rice. And we sure know how to cook rice in different forms…. But Really….Is Rice Healthy To Eat? That is, it depend’s on the type of rice that you are eating. They do this to increase the taste of the rice, the quality of the cooking as well as the shelf life. This is why people who are diabetic are advised to reduce the amount of white rice they eat, because when you eat white rice in too much quantity can increase the level of sugar in the blood. On the other hand, brown rice contains a fair amount of fibre. The fibre content of brown rice is 1.8%. This is exactly why your stomach will feel and stay full quickly when you eat brown rice. the best rice to eat is “Brown Rice”. This is because brown rice contains more fibre than white rice, and the whole grain is intact and contains 1.8% fibre. Brown rice is also a low-glycemic food which means it’s good for people who are diabetic. When it comes to losing weight, eating brown rice is healthier for you to eat than white rice. And it’s very easy to get this type of rice from the local market. 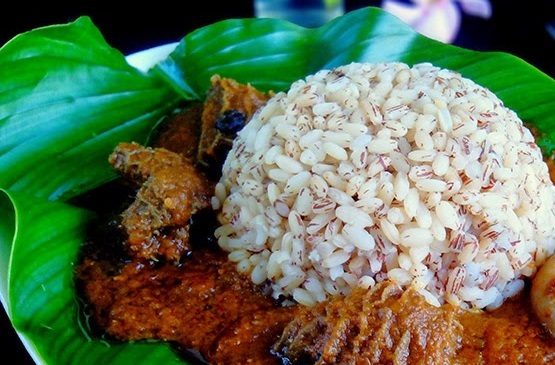 Please note, brown Rice is also known as Ofada Rice or Local rice. So when you want to eat rice, eat the brown rice instead, however, if you ABSOLUTELY have to eat white rice, eat it in very small quantity. There are other healthy delicious Nigerian foods that you can eat that will help you lose weight. And if you are interested in these healthy Nigerian foods, I want to STRONGLY encourage you to get my 100% Nigerian Fat Loss Cookbook by clicking this link.